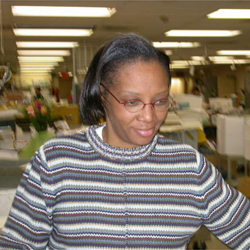 Dollie prepares almost every piece of mail that goes out of the plant. Dollie was born and raised in North Carolina. She loves to shop, watch movies, eat and go to parties. She has one son who she is very proud of. Dollie started at Tyler in January 1984.